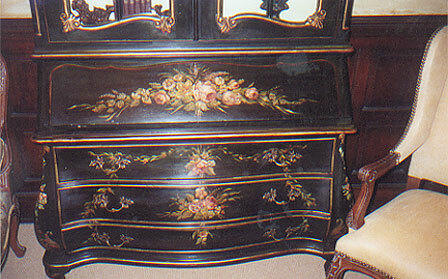 This large Italian piece was done in black lacquer with (a) painted floral ornament. The theme of this project was to recreate the surface of papier-mache furniture produced in the nineteenth century. Gilded accents trimmed in transparent colored varnishes add to the movement and interest.The interior is done in a shade of matte gold toned to suggest aged silk.